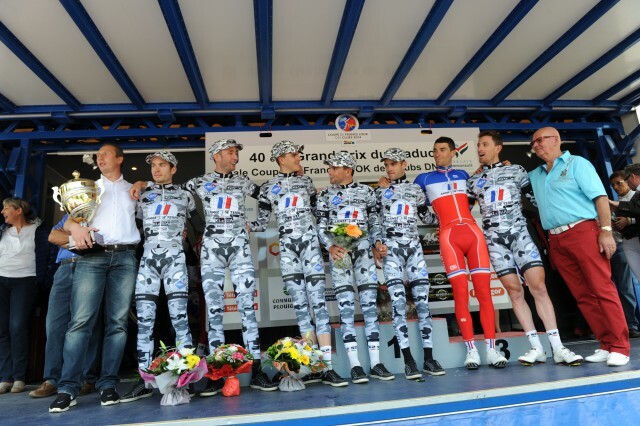 Forget Tinkoff-Saxo’s temporary training kit, here’s the real deal on camouflage cycle clothing: the French army cycling team. They’ve been an amateur squad but now turn pro for 2015. The Armée de Terre team has been one of the strongest outfits on the French amateur circuit and well-supported too with the trappings of a pro team like a fleet of vehicles. Now the whole squad is moving up a level and they will ride at UCI Continental level in 2015. But it’s not been easy because to have a pro team you need riders on pro contracts. Only the Armée de Terre team have soldiers and all the riders have signed the standard three year military engagement contract meaning they’re soldiers, not cyclists. Now they’ll ride their bikes all the time but in the eyes of the law they’re military first. Why? Well the army wants to show itself in a better light and to offer budding athletes it can foster their careers; Pauline Ferrand-Prévot might race for Rabo-Liv but she’s also on the payroll of the French Defence Ministry as an elite athlete which adds a new meaning to “defending champion”. It’s still a state-funded sports team and you wonder if the money might be better spent on a proper national development programme rather than a military sideline but this is a tale of ministerial budgets and pet projects. One of the leading forces behind the team is defence minister Jean-Yves Le Drian, a politician from Brittany… where he was instrumental in getting the Bretagne-Séché team off the ground too taking it from a regional team to the Tour de France last summer. There’s now a race to beat the Hour Record with several riders announcing plans to have a go early next year. In fact it’s not really the riders themselves but their teams, this is a big show for manufacturers to ensure the spotlight is on their bike. Breaking the record is great, even holding it for a short while means the name is engraved in cycling’s history book. But failing could be miserable, there’s a good chance someone slips up. It all feels like the recent wave of attempts are only keeping the record warm for Bradley Wiggins. I feel sorry for Mauro Santambrogio. It’s bad enough to be busted for a banned substance while still serving a ban but then he surrenders any remaining dignity by going public about problems with his pecker. There are claims and counter claims about the effectiveness of testosterone here and it seems all about the dosage, too much and it doesn’t help fertility and hinders it as the male body stops producing it naturally. But a little can top off low levels says The Internet. Regardless of whether it works or not there are no excuses as strict liability applies: it’s a positive test and since he held a racing licence the only question is if he gets a lifetime ban as this is his second offence after the EPO bust or will the hearing just take pity? Either way his time’s up in pro cycling. Talking of lifetime bans, a quick comment on the reheated story of Tejay van Garderen’s association with Lance Armstrong. It came to light earlier this year but didn’t seem to get much traction. Now it’s flared up again because Rouleur interviewed Armstrong and the pictures appeared. It’s foolish to say the least and in last week’s media day at the BMC Racing training camp van Garderen couldn’t understand why he could ride George Hincapie’s gran fondo or speak to Christian Vandevelde on TV but risked a roasting for training with Armstrong. Well there’s the perception to start with, riding an event or being interviewed on TV is not the same as being trained by someone. But the factual point is that the likes of Hincapie and Vandevelde eventually confessed and cooperated with USADA while Armstrong used every chance to deny, lie and block investigations and this, combined with his instrumental role in organising the US Postal/Discovery team doping programme, meant when he was finally caught he got a life ban. For those who say the Christmas holidays can be stressful, see the case of Diego Ulissi. The Tuscan tested positive in the Giro for a maxi-dose of asthma medicine and underwent trials to prove it was all normal. Now his hearing is being this Tuesday. For all the Padova file’s allegation Michele Ferrari seems a figure of the past. The recent scandals relate to alleged links in 2010 and 2011 and there’s little to suggest contemporary activity although there are whispers that the old camper van has been on the road. In fact even for those determined to dope he’s gone from asset to liability given many of his clients have been caught despite paying for his services. He’s lost his touch. 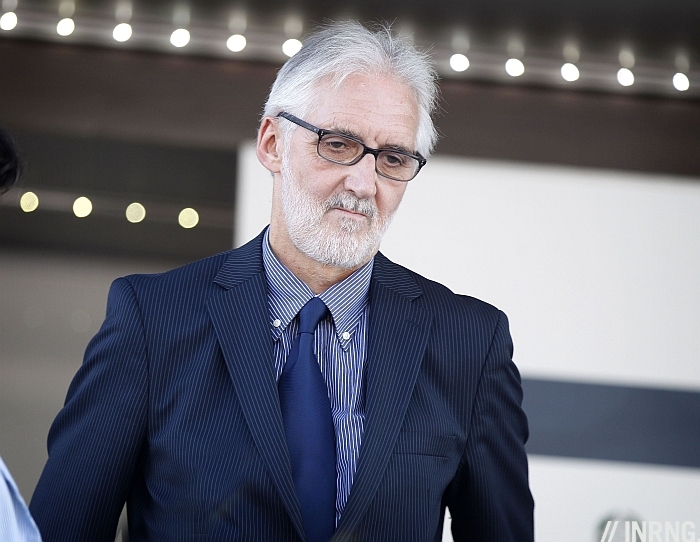 Brian Cookson gave a lengthy interview for Saturday’s La Gazzetta Dello Sport some of which has been translated by cyclingnews.com into English. One thing cyclingnews missed is that he says the new international anti-doping tribunal will be up and running in January. As a reminder the UCI – perhaps you too- had grown frustrated with national federations and agencies ruling on their local riders and what we could call home bias at times meaning the UCI resorted to an appeal at the Court of Arbitration for Sport in order to achieve a ban or other conviction. Now all riders in the World Tour and Pro Continental levels will have their cases heard by the UCI’s International Tribunal rather than a local agency. It’s a good idea in theory but the practice will be worth watching. 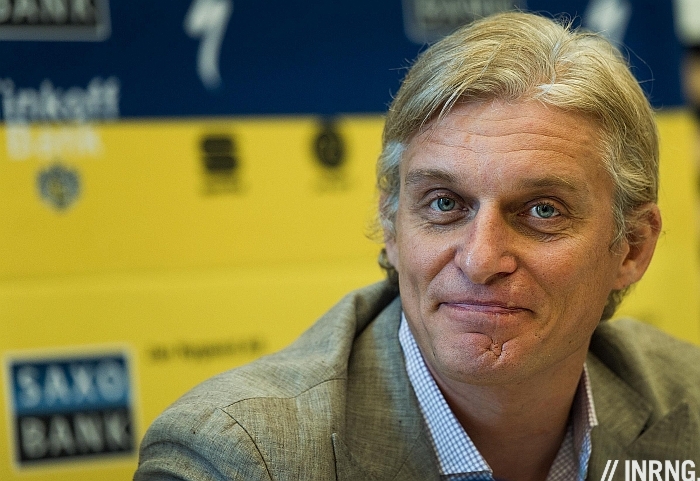 Talking of former glories, many might still refer to Oleg Tinkov as a “billionaire”. He’s probably not any more. How do you define billionaire anyway? Either way he’s lost a lot of money of late. The value of his Tinkoff Credit Systems credit card business has fallen so much the chart looks less like a downhill stage of the Giro and more like the profile of a heli-ski trip. Interest rates were raised from 10 to 17% the other day in Russia. To keep it short the interest rate is the price of money and for a credit card company it means the price of their raw material soared all of a sudden. The good news is that he did sell a lot of the shares at a high price and, like any wealthy Russian, presumably retains most of his wealth outside of Russia. But the bad news is that he still owns about 50% of TCS meaning his net worth has fallen. The team’s in no danger because if he’s no longer a billionaire, he’s still worth hundreds of millions. Last but not least if Christmas is all about giving then buy yourself a cap or two as the profits help keep this blog on the road and the support is much appreciated. Thanks to all those who’ve helped already and I’ve enjoyed the emails and tweets showing the caps out on rides around the world plus a few podium places already. They’re just £7.50 (about $12 / €10) plus postage which depends on the destination. They are now made in two sizes and available in black or white. To get your hands on one visit the prendas.co.uk shop. Uhh … those Google searches about erectile problems in my browser history – just for the cycling blog, luv. Honest. BTW what are the potential pitfalls of the UCI’s International Tribunal. Legal? Resources? Thanks for the great content throughout 2014, inrng. Cost is a big thing, the UCI will have to budget for the role normally covered by national agencies. Plus if it’s independent then there’s a good chance the UCI gets taken to appeal at the CAS and might have to pay up. Theoretically we’ll see how the separation of powers works, is the tribunal really independent, given many think the best form of justice happens when the judiciary is kept separate from the executive. Who will appoint the members of the Tribunal? I agree with VanGarderen, what is the difference between any of the guys who eventually confessed under the USADA investigation? None came forward willingly, most gave testimony in order to broker a deal on their sentence. Lance was arguably the only one to make his confessions in public – staged of course but public nevertheless. Cycling is littered with ex-dopers, I’d imagine the list of coaches who have totally clean histories is a very short one – not that anyone would know. WRT to Santambrogio: lets assume for a moment that he’s not lying. Any pro cyclist who is serving a ban for drugs and decides to embark on a course of therapy using a drug that is not just on the banned substance list but also perhaps one of the most high-profile drugs used by cheats is not really thinking things through. At best, this case shows monumental naivety. At worst, its up there with Riccos self-administered transfusions. Some riders seem to have low IQs, like any cross-section of the population. Pro cycling has to be the only place where someone goes public with erectile dysfunction in order to help save their reputation. Meanwhile Van Garderen traded one motorpacing session for the hassle of being asked every time he shows up to a race whether he’s being still coached by Lance Armstrong. According to his Twitter TVG does read literary fiction (he mentioned enjoying Julian Barnes’s “The Sense of an Ending”, an excellent novel) but it seems his good taste is limited to books. As another commentator remarked, surely there’s someone else in Aspen who owns a Vespa and has some free time? That’s true of Hincapie and Hamilton. They were hauled in and questioned with the virtual badge and gun on the table. But that was when it was still being handled by Novitsky, who had that power/authority invested in the FDA. However, USADA do not have that same power. USADA have no direct power of sub-poena. You’re saying that Zabriskie, Danielson, and Van de Velde choose on their own? I don’t believe so. Vaughters told them they didn’t have an option. He said in public that all the members of his team would appear before relevant tribunals and would tell the truth. I.e., you don’t go and/or you lie, you’re fired. That’s not exactly the same as PT lumping them all in together with Hamilton and Hincapie facing the full weight of grand juries and the FDA. I’m no fan of any of this crew in any way. What hour record are they trying to beat this time? The one with no limitations on bicycles, held by Boardman in his Superman position? The one on dropbars, held by Sosenka? Or the one on dropbars EPO-free, held by Merckx? One gets a little a lost as to what guys are trying to achieve. Strictly speaking it’s the “UCI Hour Record” and the rule is that riders can use whatever is approved for use on the track. So if a 4km pursuit bike is allowed for the 4km pursuit it’s also valid for a longer TT like the Hour. It is confusing but the UCI has tried to reset the count and re-drawing this line in the sand has helped launch many new record attempts. Jack Bobridge broke Boardman’s ‘Superman’ pursuit record several years back, so I wouldn’t be surprised if someone beats the ‘Superman’ hour record by the end of 2015. That would clear up the confusion suffered by the previous poster. Rubbish. Sorry. What is the rationale behind allowing the 4km pursuit bike and not the Superman position? I don’t think there is any. And the fact that there are more attempts… isn’t it due merely to the fact that the record has become more accessible? And when we say more accessible, it means devalued. Cheapened. What is there to celebrate about it? If, in ten years, we reset the count again, and we find a way to say that only Coppi’s record (or any other record) is the right one, hence launching a new wave of attempts that provide a few headlines on cyclingnews, will there be again reason to celebrate? Shall we praise whoever runs the UCI for cheaply “revitalizing” the record and catching the interest of bicycle makeers? Rationale? Just that those are the rules, if a bike is approved on the track then it’s allowed for the hour too; the same that say you can’t use fairings etc. I can understand your frustration but the rules have kept changing over the decades, they’ve never been that fixed. There’s still a “best hour performance” rule too but that’s another rule and Boardman’s superman position rule still stands under this rule. When it comes to standard-setting, rules should be meant to serve a long-term purpose to make sense. And athletic records, as well as defining what is and what is not an authoriuzed bike for a certian purpose, are standard-setting. The new rules do not make sense if you do not reinstate past records. It is either the Merckx-Sosenka concept or the previous Moser-Boardman one, but it is simply not fair towards previous contenders to create a new concept from zero. It is just too easy. An athletic record must carry the implicit “all-time” epithet, otherwise it’s a joke that has no place in, well, records. If I was Chris Boardman, I would be very angry at the way the UCI has unfairly wangled the rules, with , apparently, short-term objectives in mind. One wonders why Armstrong decided to out Van Garderen in this way? Thats a bloody good question. He never does something without a motive. Armstrong’s motivation seems clear to me – he tries to make himself salonenfähig (socially eligible) again. Whom I really don’t understand is Tejay. Is the risk worth the gain (whatsoever)? Working with LA is a comparable stigma as working with dr. Ferrari. Lance was once what finance managers call “too big to fail”. Hundreds millions of dollars flow, friends with top politicians and other celebrities… But as one Brittish finance minister said: “If a bank is too big to fail, than it is too big.” And the deserved failure damaged the business severly. I wish camo would go away as any sort of non-military fashion. BigTex still wants to be part of the club. The question is WHY any of his former associates have anything to do with him these days, especially where bicycles are concerned. Reminds me of the Cobra Modenese, who said something about how he would never cheat again…or would do it differently and then wonders why they didn’t shorten his ban? Amazingly, some folks still do not get it, including the numbskull with the erectile malfunction excuse. Do they really think we’re that stupid? Unless one has access to the current financial records of Dr. Ferrari and his son, I wouldn’t be so quick to say he’s out of the game. I’d bet he’s ahead of the testers and rules as usual, probably using some stuff we’ve yet to hear about. There’s a lot of people in this post I almost feel sorry for… almost. The army team is interesting! Reminds me of the person on here who quipped about a PMC or arms manufacturer sponsoring a team. Tejay needs to lose his PR advisor as well as his moped pilot. I have always liked TJ, but this incident displays some incredibly poor judgement. First off, why would you want to ride Hincape’s (a very willing doping participant) Gran Fondo? Worse yet you have Armstrong motor pace you? I cannot think of any reason a cyclist would associate with those individuals. I’d rather Lance motor pace me then my current pacer. My girlfriend is no good on the clutch. Long before VespaGate transpired, I have thought that the BMC machine, and especially Och’, knowing his way around PR, seem to have failed to provide Tejay with some basic training with specific regard to interviews. Talented, certainly, but does not present himself, and therefore the team, very well. In some ways, his attitude is reminiscent of another rider- oh, that’s right- his substitute moto. Just my opinion. As far as the hour goes, I wonder if Sir Bradley would be warming the throne for Tony? 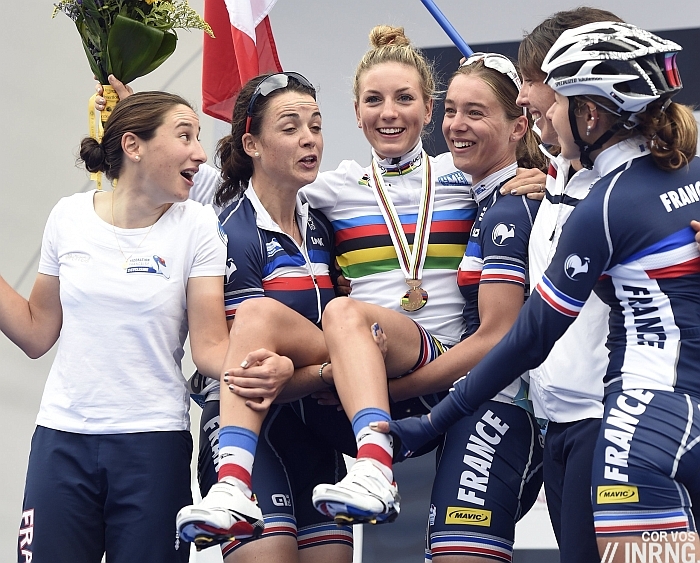 The photo of Pauline Ferrand-Prévot and her joyous teammates celebrating her fine victory is a reminder of what is great about this beautiful sport we all love. Can’t wait for the start of the season! Needs to gain some brain cells too. Do either the training-with-Lance or the reasonings at the PR day strike anyone as the mature actions of a team leader? The bloke still tests positive for foot-in-mouth disease way too frequently. As far as I am concerned the lesson in the vespa debacle is not that Lance is a manipulative creature who uses every opportunity to try and make it seem like he was/is just one of the guys when it came to doping. No. We all know he was in fact a ringleader, THE enforcer of the omerta in the peloton and in the public space who used cancer as a cloak — to say the guy is a nasty p.o.s. is to say nothing. The lesson is that current, active U.S. pros such as Tejay willingly believe Lance’s lies (don’t say he is stupid: that’s really more about you the fanboy, trying to give tejay an out). In other words, Tejay and his Lance backing cronies in the us pro peloton have no moral compass. In other words, I would absolutely not be surprised if they doped. Love the French Army duds. Seems like a great way attract recruits. Cool kits and athletic endeavors. Moving up to Pro Conti ? It will certainly give them more exposure, but don’t know if they can continue winning. They are soldiers first. Same here in US. The Army has been sponsoring numerous freestyle snowboard/ski events. Conti, not Pro-Conti. Big difference. They’ve got the resources and the riders to get results at that level, especially as France still runs a lot of smaller UCI-ranked races. If I ran, or was part of the management of, the UCI and I wanted complete control of the sport (who wins, who loses; who works, who doesn’t, who makes the most money, who is allowed to just get by…), I would create an “International” anti-doping tribunal. Absolutely, there is going to be home bias, but that is why the UCI can appeal to CAS. The system is moderately successful, and a lot less expensive than the Tribunal will be. CAS is independent And International. For all his campaign rhetoric, with anti doping still down the hall (no positives? YAY!! we’re all cleaned up!) and the tribunal headed for two doors further, Cookson’s cooking the results and they smell pretty fishy. “No positives” since Cookson took over? Eh, ‘Anonymous’? What are you talking about? The closest thing to ‘we’re clean now woo’ I’ve seen from someone involved in the pro scene was Voigt’s blog post about doping (I like the guy but it was a pretty dang idealistic post even by my idealistic standards) and even he didn’t go so far as to say it was eradicated. I know UCI is implicated in covering up doping (not the details), BUT that’s besides the point a lot of anti-UCI comments, in light of… the entire last month for one thing, come across as pointless, muddying hyperbole. Would anyone who’s been around longer and has more evidence than ‘Cookson is ugly’ be willing to elucidate? Was it some badly-timed press release from two years ago people are still mocking? I’m stumped. It’s impossible to say doping is over, it’s the same as a police chief declaring the end of crime or a historian proclaiming the end of history. Such hubris would only lead to a prompt fall. Besides look at the riders who continue to be caught. So the couldn’t say this and it would be unwise to try it too. Exactly! But I don’t know if people who infer things like ‘Cookson is obviously corrupt’ or ‘UCI is claiming the sport is cleaned up and hunky-dory to fool the gullible’ are referring to things that were ever actually spoken or written, or are extrapolating from more measured statements for whatever reason. I think we project a lot of hope onto things like regime change at UCI. Just like if/when FIFA could be cleansed of Sepp Blattter or F1 of Bernie Ecclestone in favor of persons with integrity, improvements will come at a glacial pace despite our dream of a benevolent dictator sweeping away all the bad stuff. When Cookson seems hamstrung by bothersome things like rules and procedures we get impatient and start wondering if he has the will to really clean up the mess? It’s easy to get frustrated when those who’ve seen bits of the BigTex saga in the mainstream media ask “Have they cleaned up the doping in cycling yet?” as if it would be simple. The latest fiasco with Astana has brought all this to the forefront yet again. Same with the other recent news – with the same old dope used by the same old dopes. The urge to “do something, even if it’s wrong!” is very powerful. I think you’re right re hope and expectations, Larry. But if cycling is changing, its going to be a very very long haul. People need to try to understand that. Serious answer: cycling attracts conspiracy-theory nutjobs in its social-media comments like no other sport I know. Unfortunately, this is partly because other nutjobs, who see and/or run conspiracies everywhere, have held or continue to hold major, influential positions within the sport. It’s a sport far too ripe for bigoted, dog-in-the-manger types to try and drag everyone else down to their miserable level. I’m with you; no one should have to be dragged down to Cookson’s level. Thanks for your nutjob-answer, made me smile after a hard day at work. Although in this special case I too think this “Tribunal” is one of those “sounds maybe sort of good, but only in theory and if you don’t think about it and look to closely-things” and in 5 years from now we will watch while they clean up the mess they made. Shawn, if I am not mistaken, since he has not announced retirement, and has intention to ride again, he therefore needs to remain in the active UCI testing pool, regardless of suspended status. Someone please correct me if I am in error. It sounds like a “flaccid” excuse to me. In the Gazzetta dello Sport they mention that he wasn’t even registered as a cyclist at the time of his therapy for “erectile disfunction”. I think they’re trying to make excuses for him. I agree with your factual reasons for differentiating Armstrong from others. I would only add also, that I believe Lance has deserved harsher treatment than other dopers due to his truly abominable behaviour towards other human beings – for example, trying to destroy, financially and in reputation, people who argued that Lance was a cheat and in many cases, knew a little too much for his liking and started to share some of their knowledge. This brutally selfish behaviour, with complete lack of feeling for the consequences to individual humans, is what sets him so very low in my eyes. I understand all of this but wanted to step away from the moral judgement and explore the factual aspect because while we might try to relativity, the rules have provided their verdict. Unfair? Perhaps but that’s what all the riders sign up to. Worth noting the new WADA Code for 2015 sees several changes and one big one is “association”, those caught associating with banned coaches and athletes themselves risk bans. Vicky Pendleton investigating “the mind of a cyclist”, with contributions from Pendleton herself, Chris Hoy, Rob Hayles, Wendy Houvenaghel and a long interview with Bradley Wiggins, as well as from Dr Steve Peters. Some fascinating contrasts in their mental approach from the core of what was very much a “golden generation” in British cycling – in particular its interesting how VP seemed to completely buy in to Steve Peter’s approach, whereas Wiggins was / is much more sceptical. Interesting how Hayles has the view that he traded longevity for absolute success in his career. And it is also interesting how both Hoy and Wiggins both reference Jason Queally as the inspirational figure in their careers, and more generally the importance of inspirational figures in general. It’s two hours, so plenty of time for the interviews to “breathe” and develop at some length. I heard it yes and would recommend it to others although if it’s a good listen if a bit long. Wiggin’s impressions of Zabriskie and Armstrong (at 56mins onwards) are amusing too. If one of the list of talented riders doing the hour record attempt wanted to make life harder for Wiggins, they should go to a good quality altitude track such as Aguascalientes in Mexico. It would add ~2km to their ride, give or take*. But no one will because it’s a much greater commitment (financially and logistically) and their sponsors more than likely would prefer for their attempts to be ridden at local low altitude tracks where they can generate more publicity. If a rider was serious about setting the best distance possible, well as Yazz once said, “the only way is up”. You need to make a larger size in those caps. How on earth is one supposed to pull off a Henk Lubberding in one of those? That man knew a thing or two about luft – something that most casquette makers are getting very wrong these days. After all these are not supposed to be swimming caps with visors. There are two sizes now but I can get luft-off with the original version. Interestingly, the Panasonic casquette on Henk Lubbering’s flowing locks was made in the same factory as the current INRNG cap, despite the generation gap. However, the two caps have a different method of construction. 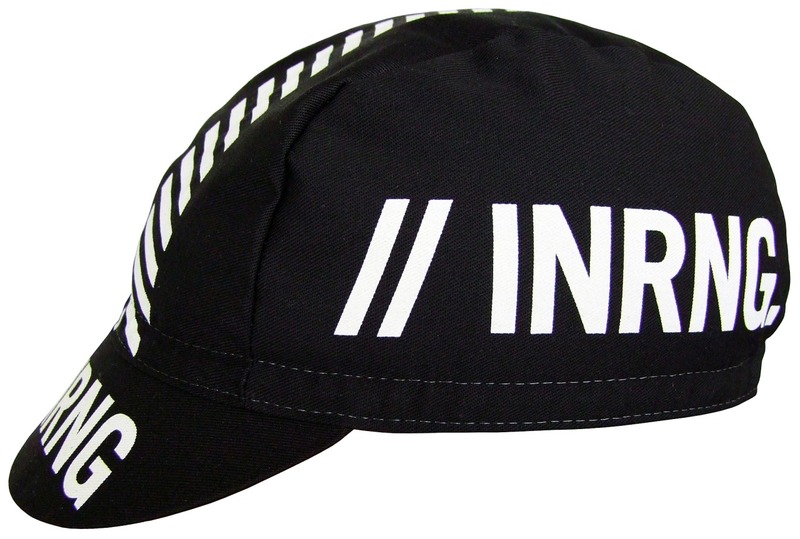 The centre stripe of the Panasonic cap is a ribbon sewn onto the cap, the chevrons on the INRNG cap are printed and much wider than the ribbon which necessitates a wider centre panel being used in the construction, hence a slightly “snugger” fit. Previous post: Who Speaks for the Riders?